The first Russian motor-expedition company. Organization and support of mototours and expeditions. We drove through dozens of countries and are ready to share our experience and knowledge with you. The general experience of practical motorcycle trips. Mototours accompanied by experienced guides on unique routes. The directions of our trips are unparalleled and often impossible without an organized group. We are always ready to organize additional activities for the expedition members. If you have the opportunity and desire we can extend the itinerary of arrival. Choose a direction. Write or call us. If you have your own ideas - voice them. We are ready to work and accompany you along the roads of your dreams. We provide motorcycles for rent. The model range GS 2017. Under the terms and cost of the rental specify by phone or e-mail. Diagnostics, repair and preparation of motorcycles of any complexity, evacuation and storage. Retrofit and tuning. 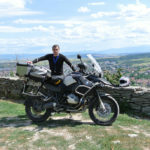 Accompanying professional guide single tourists and groups in motorcycle trips. Assistance in organizing, planning and developing routes. Our staff will quickly help resolve visa issues to citizens of the Russian Federation and foreigners.